Last year I asked my youngest son if he would draw several robots for me. He felt his skills weren't up to the task, but I could remember the robots he used to draw as a child and knew he would be able to come up with exactly what I was after. I'm planning a quilt for a young boy and hope to feature nine different robots. The robot wine waiter was one of the first sketches he drew for me and I LOVE it!!! Although I'm not planning on using it in a child's quilt, it's just perfect for a cushion. 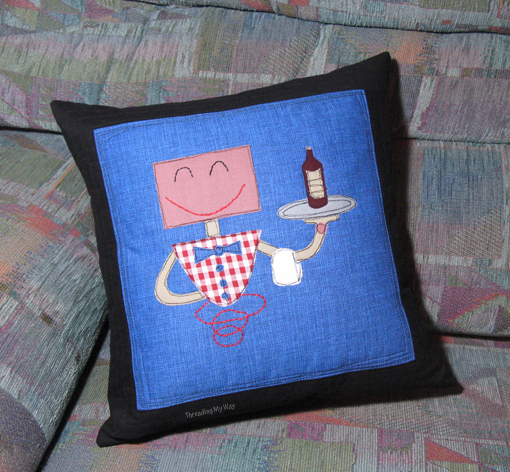 The majority of the robot is appliquéd to the cushion with double sided fusible webbing and then outlined with scribbly stitching. I love the effect of the stitching. Not only does it define the edges, it also enables features such as the wine label to be drawn in. It's fun to do, too, as you really can't make a mistake. Some of the pieces, such the buttons and the wrist are very small, but the detail really does add to the finished look.To finish off the robot, the eyes, mouth and bottom are backstitched on. The back of each cushion is closed with a hidden zipper, using made by ChrissieD's fabulous hidden zipper tutorial. It makes a very neat finish to the back of the cushion. I really do adore these two cushions and was really tempted to keep them for myself, but I've given them to my son and his wife. Once I get my head around Inkscape... resizing, separating elements and converting to different formats... I'll share the template, hopefully in the not too distant future. My son finished the nine robots for the quilt quite some time ago and as I expected, they are just awesome!!! 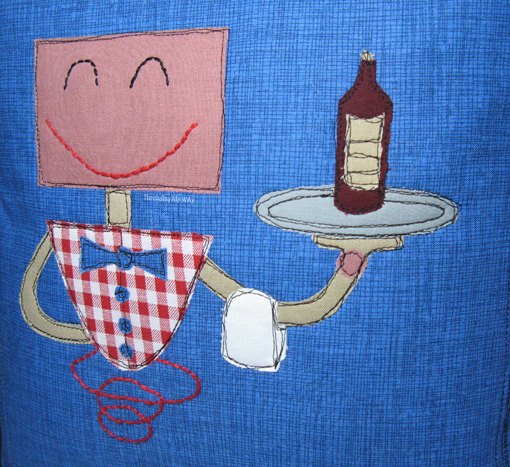 The robot wine waiter is no longer a wine waiter, but he has been modified and will be appearing on the quilt. I've been dragging the chain somewhat. Now it's up to me to turn them into a quilt. 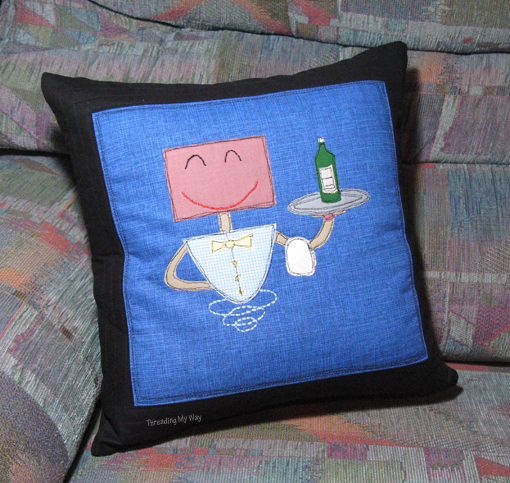 The wine waiter cushions will be joining the 170+ projects in the cushions and pillows collection here at Threading My Way. 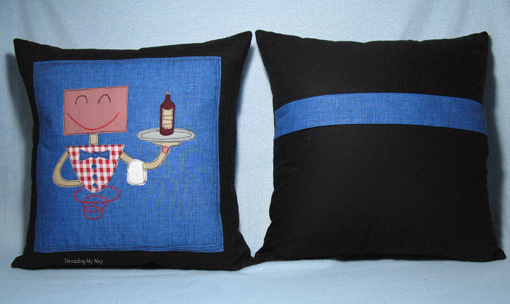 If you've made a cushion or pillow, I'd love you to add it, too. They are cute!!! 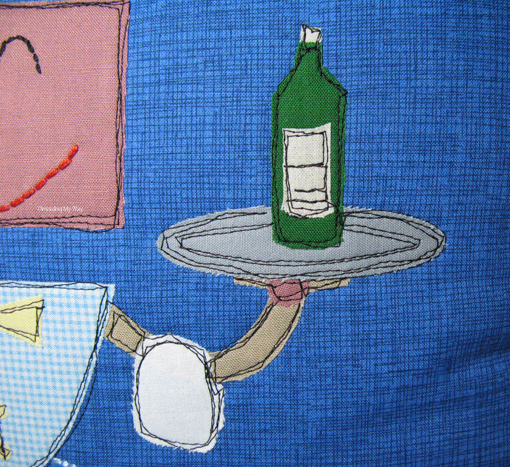 Their big smiles put a smile on my face too :) I love the stitching, perfect for the original hand drawing. I see the wine bottles would not be suitable for a young boy, but I am looking forward to seeing other robots you buys are going to create! 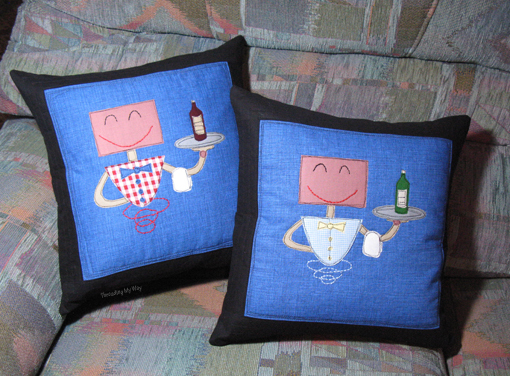 Happy cushions those are! And I love the scribbly stitching.Was it done free hand with the machine? These are so cool!!! Love the scribble stitching - I was wondering too, was it done using free motion?? how cool is that!!! What a great collaboration - can't wait to see the quilt! Pam your son's robots are so cute. I love the pillows! What a cute set! Absolutely adorable! Love that scribbly stitching. Adorable, would be great on tea towels too! Great to see you on Craft schooling Sunday!